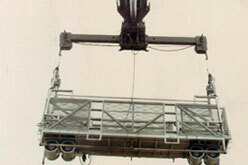 The Cranes shown in the following pictures are purpose built building maintenance units. 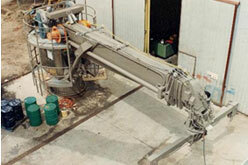 These machines utilise full CNC control to allow the operator to have fast effective and accurate positioning of the work platform. 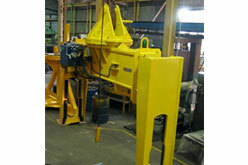 Custom roll Lifting rig for the moving of rollers in a Hot Strip Mill, This rig attaches to a overhead crane. 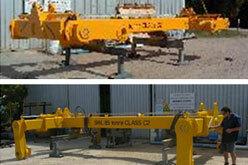 This unit houses its own hydraulic power pack for endless slewing of the rig and positioning of the lifting arms.